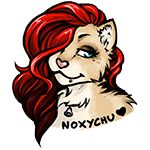 We are super excited to introduce this year’s 2016 Guest of Honor, Noxychu! She comes to the furry fandom via the World of Warcraft fandom, and has totally fallen in love with our fandom. Read all about her on our Guest of Honor page!